Here are some tips to get the best out of your experience. Know that it will take some time for the tour to actually begin. After going through the UN's airport-esque security, there’s a considerable line to buy tickets. Once the tickets are bought, guests can wait up to an hour until their tours begin. The tour costs $16 for adults, $11 for seniors and students, and $9 for children 5-12 years of age (children under 5 aren’t allowed). An ATM, along with the gift and coffee shops, can be found on the lower level. Visitors can use their long wait times as an opportunity to check out the free exhibits in the lobby. They change every few months and highlight current world issues. Through August 28, the Main Gallery features “World Press Photos 2011.” This exhibit contains the winners of the World Press Photo Contest , 177 powerful photographs that relate to news events worldwide. Also current, through October 15, visitors can see a gripping exhibition of images of some of the 12 million stateless people worldwide. “The World’s Stateless” gives a human face to this global issue and brings to light the forgotten and vulnerable people of the world. UN stamps are collectables because of the UN’s unique disposition. The UN is neither a country nor a government and is the only organization like this in the world that has the authority to issue stamps. Remember, though, they can only be used from UN offices in New York, Vienna, and Geneva. 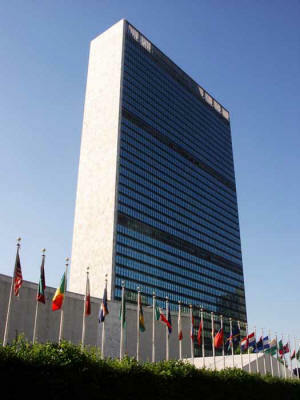 The tour covers information such as the history and current structure of the UN in addition to other UN issues and goals. The tour, at times, is a little reminiscent of a college lecture, but there’s nothing quite like the General Assembly Hall. Truly the high point of the tour. the General Assembly Hall and its visual grandeur have has everyone’s cameras clicking non-stop. Tours are conducted Monday through Friday from 9:45 am to 4:45 pm, and last approximately 45 minutes. After the tour, you can enjoy lunch and a view of the East River at the UN Delegates Dining Room. It’s open Monday through Friday, 11:30 am – 2:30 pm, and reservations are required. Call (212) 963-7625 or (212) 963-7626, at least 24 hours in advance. Business attire is required. Chef Daryl Schembeck does a marvelous job putting together a buffet with cuisines from all over the world. This entry was posted on Monday, August 15th, 2011 at 3:46 am	and is filed under Stuff to Do. You can follow any responses to this entry through the RSS 2.0 feed. You can leave a response, or trackback from your own site.